If you are driving abroad this Summer make sure you are legal to travel before leaving home. Something as simple as driving without a GB sticker can result in an immediate on-the-spot fine in some European countries. Many Brits believe the French Police actually look forward to the upsurge of UK holiday traffic and view the Brits as an easy target. True or not, keeping within the law is easy enough if you know what’s required. Motoring rules change between different European countries; for example, in France only one warning triangle is required, whilst in Spain two are needed. In some countries a First Aid kit is required, whilst not in others. Only a single Reflective vest is required for the driver in France although the French Société Prévention Routiére recommend vest are carried for all passengers, as is the legal requirement in Spain. Mail order specialist, Car Parts Direct supply a complete European Travel Kit that contains the basic legal requirements for driving in all European countries. 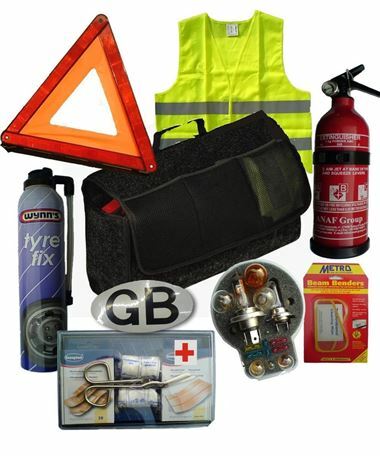 As well as a Warning triangle (you'll need a second one for Spain), there’s the compulsory Spare bulb & fuse kit, First aid kit, Fire extinguisher, GB sticker and Headlamp beam deflector kit and High visibility vest. Importantly, there’s also an aerosol Instant tyre fix in the kit. The kit is supplied in a handy holdall with Velcro backing so it secures neatly in to the boot, taking up minimal space. Additional Warning triangles and High visibility vests can be added as required. (In addition to two warning triangles in Spain, one high vis vest is needed for everyone inside the car). You’ll find useful information for travelling in abroad and the European Travel kit is available online at £69 from www.carparts-direct.co.uk or call 0871 918 2712.